I love Juliet Marillier. I will just start by saying that. I loved Wildwood Dancing- it is still hands down my favorite book of all time. I enjoyed her other series (but they were more mature in theme), and I was so excited to see another YA book from this author. I have to say- I was not disappointed in the least. Now I will admit, this book started slowly. I had a hard time with the book at first- it is the kind that jumps right into the story with no back story. The story moves slowly and grows slowly just like stories like Poison Study or Shadow and Bone. This is a classic fantasy story that creates an entirely new world and uses incredible world building. Things don't happen instantly- there is no insta-love or insta-powers. Things develop organically and really are much more satisfying that way. I think this would make such a fun movie! I wish I could see the cast of characters- because there really is a cast of characters in this book! I will say, I got to the end of the book waiting for some sudden action-packed cliffhanger. This wasn't the case. 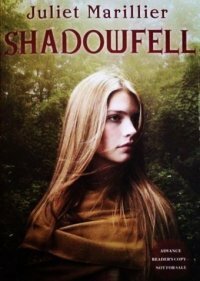 In Shadowfell, the book is almost cut off mid-scene. It made me angry, but only because I know I have to wait for the next installment to finish what I was reading. I loved this book! If you are a fan of fantasy or of Shadow and Bone- absolutely check it out! You spelled her name wrong in your review, FYI. But thanks for the review! I like her too.